"A warm French custard with brandied cherries. Almost any fruit can be used in this recipe." Mix cherries, brandy, and 1/3 cup white sugar in a bowl; let soak for 1 hour. Preheat the oven to 450 degrees F (230 degrees C). Spray a 9-inch pie pan with cooking spray. 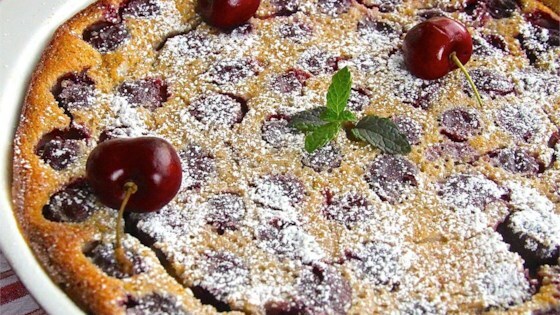 Remove cherries from brandy mixture using a slotted spoon and transfer to the prepared pie pan. Pour brandy mixture into a blender; add remaining 1/3 cup sugar, milk, flour, eggs, vanilla extract, lemon zest, salt, and allspice to the blender. Pulse mixture until batter is smooth; pour over cherries. Bake in the preheated oven for 5 minutes. Reduce heat to 350 degrees F (175 degrees C) and continue baking until golden and puffy, 45 to 50 minutes. Cool slightly and dust with confectioners' sugar to serve. It turned out great! It was custardy and light. It was as easy to make as explained in the directions but used slightly less sugar. I find that it is a nice balance of sweet and tart.